When I added cordyceps to my morning supplements, I noticed a substantial increase in my energy levels. Other people have shared with me that taking cordyceps improved their endurance while exercising. These experiences made me curious to investigate this medicinal mushroom further. Cordyceps falls in the category of traditional herbs known as adaptogens that increase stamina and help the body compensate for excess stress. While the only study showing it to reduce the stress response was done in rats, several human studies support the claims about endurance. During periods of exertion, cordyceps has been shown to increase the dilation of the aorta, the largest artery in the body, thereby providing improved blood flow to active muscles. In one study, 72% of long distance runners observed improved performance when using cordyceps. Another study demonstrated that older participants could work out longer before starting to build up lactic acid, a compound that contributes to muscle soreness. Cordyceps is traditionally known as an anti-aging and rejuvenating herb. I think this claim is well supported by a multitude of research showing how it can protect our bodies from many different types of damage. Cordyceps contains antioxidant compounds that protect our cells from damaging free radicals. Several different compounds in cordyceps also show potential anti-tumor properties. Cordyceps even helps defend us against some viruses while simultaneously stimulating the immune system. Cordyceps benefits the heart by helping to reduce cholesterol and the oxidation of cholesterol, in turn reducing the deposition of cholesterol onto artery walls, which is what happens in atherosclerosis. Cordyceps was also shown to prevent damage to the kidneys from certain toxic substances. 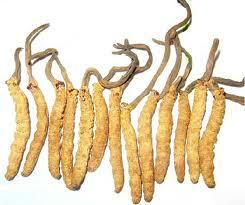 Finally, cordyceps has been traditionally regarded as a sexual tonic and libido enhancer. This claim is supported by research that shows that cordyceps can help modulate hormone production as well as improve blood flow and energy. This entry was posted in Herbs and tagged antioxidant, antiviral, cardiovascular disease, cholesterol lowering, endurance, energy, fatigue, health, libido, sexual tonic, stamina, stress. Bookmark the permalink.